China’s Charity Law went into effect on September 1, 2016. It loosens registration requirements for domestic charities while bringing a wider range of organizations under state control and oversight. In contrast to the U.S. tax code, which narrowly defines “public charities” versus private foundations and other types of tax-exempt organizations, China’s Charity Law effectually governs a broad universe of non-profits while refusing to define essential terms. And, of course, organizations the government regards as sensitive—including some religious, political, human rights, and other independent associations of particular segments of civil society—will not be permitted to register despite likely compliance with the law. But what does it mean, under the Charity Law, for an activity to be “charitable” (cishan, 慈善)? Though the Charity Law for the first time provides comprehensive regulation within the non-profit sector (including regulation of organizational and management requirements, fundraising and donations, volunteer activities, transparency and reporting requirements, and other provisions), it still does not clearly define this term. Other public interest activities compliant with the provisions of this law. Many Chinese attorneys and law students have a nuanced view of the definitions of charity and public interest. During both my time as an intern at Zhicheng Public Interest Lawyers in 2017 and as an instructor of an undergraduate law course in Beijing on comparative law of nonprofit organizations, I organized discussions with Chinese lawyers and interns interested in this field of law. They explained how they conceive of the distinction between the terms. First is the nature of the activity, and second is the actor carrying it out. Specifically, “public interest” is generally understood to encompass both the role of the government in providing for all citizens, and activities conducted by non-government actors that further development of the whole society. “Charity” implies activities intended to benefit disadvantaged segments of the public, and it is defined by this motive of the actor as well as the class of beneficiaries. Therefore, one commonly held understanding of the difference between public interest and charity in China is that the government can (and should) conduct public interest activities, but it cannot technically perform charitable activities. A nonprofit organization must conduct public interest activities, and targeting those activities at a disadvantaged group is charitable. A concrete example of this distinction in the Chinese context is the government’s provision of education. The Chinese government has expressly taken on public education as a government role. International legal standards such as those embodied in the International Covenant on Economic, Social, and Cultural Rights (ICESCR) likewise declare education to be an individual right that must be fulfilled by all states; China has signed and ratified ICESCR. Providing education is a public interest activity because an educated citizenry benefits society as a whole. A non-governmental actor could provide special education opportunities for disadvantaged students or for those with learning disabilities. These enhanced educational opportunities are considered charitable because they are offered to a discrete segment of the population in special need. However, if the government provided special education services to students with learning disabilities, this would not be considered charitable, because it still falls within the government’s role of providing education to all, and the government as an actor is not capable of providing charity according to this conception of the terms. The non-governmental actor, on the other hand, provides a service that is both in the public interest and is charitable. 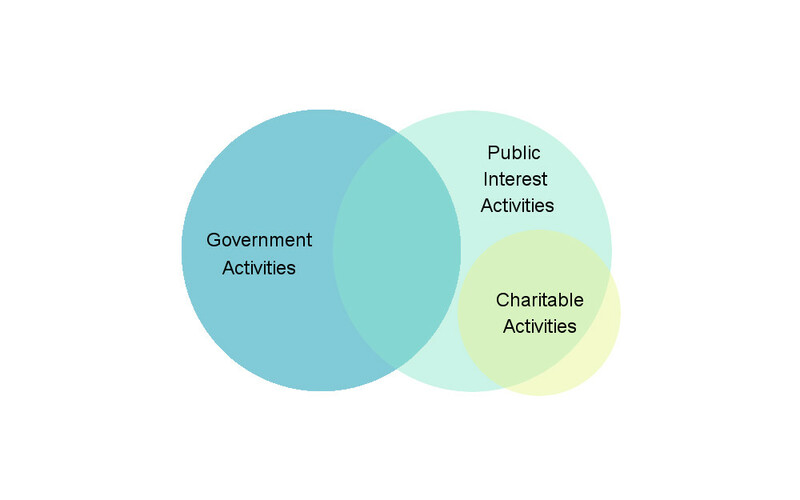 This graphical depiction represents the author’s understanding of how legal professionals in the field view the definitions of “public interest” and “charitable” in terms of government and non-government actors. In July 2017, I conducted a non-scientific survey of almost 100 Chinese citizens, including law students, lawyers, and leaders of nonprofits in China, to find out what specific activities and organizations they believe are “charitable.” I also administered the same survey to a smaller group of similarly-situated U.S. citizens for comparison. The survey asked the participants to indicate to what degree they think, believe, or feel each listed activity or organization is within their personal conception of “charitable,” and to assume that none of the activities listed are government-run. Among themselves, Chinese participants displayed clear categories of agreement, though there were also some areas of disagreement. A similar pattern played out for the U.S. participants. Comparing U.S. and Chinese participants to each other, the U.S. participants were amenable to a much wider range of activities being considered charitable than were the Chinese participants, an outcome supported by U.S. law’s broad categories and focus on organizational motive. As an example, U.S. participants readily agreed that medical facilities and arts organizations are charitable, but Chinese participants disagreed. Unbeknownst to survey respondents, all of the activities or organizations on the list are legally plausible as tax-exempt organizations or public charities in the United States. Despite that fact, U.S. participants did not accept all or even most organizations as charitable, even though U.S. tax law has long allowed for a wide range of such activities to be considered tax-exempt. For example, some U.S. participants showed hesitation to accept universities, cemeteries, recreational sports, health and lifestyle organizations, religious organizations, and labor associations as charitable. Participants may have known that some of these organizations qualify as tax-exempt in the U.S., but the survey requested that they respond based on how they think or feel about the organizations qualifying as charities. Their more restrictive definition of “charitable” bolsters the concept of societal notions of charity differing from legal regulations. In fact, despite unclear legal delineation in China, the results from the Chinese participations show some surprisingly clear consensus and offer the opportunity to draw conclusions about societal notions of charitable activity in China. Based on the specific types of activities in each category and the responses, it is a reasonable conclusion that Chinese respondents deem charitable activities to include improving conditions that negatively affect all of society equally, such as protection of the environment, and activities that aid a specific subset of the population that is deemed in special need of the services or funds, such as donating used clothing. Grant-making foundations and disaster relief are accepted as per se charitable. These conclusions are not surprising, because they reflect the core categories of charitable activities found in most societies around the world. There are varying reasons why activities under each of these categories were not seen as being charitable. Two main factors are that although many of them provide beneficial or necessary services, they mimic for-profit models (making them fall outside of public interest), and they benefit such a wide range of people (excluding them from the disadvantaged class definition of charitable). For example, citizens purchase plots in cemeteries, which is a commercial transaction that inures personal and family benefit. Likewise, although hospitals provide critical life and death services, all people need hospitals, and a healthcare transaction is a business one: an exchange of money for professional services. Finally, examples such as higher education, specialized classes, lifestyle organizations such as those advocating for vegetarianism, and arts organizations such as classes and galleries are primarily accessible to those with advantages of expendable income and free time. Even though the organizations bring value to society, they are not considered charitable because their purpose is not to benefit a disadvantaged class. The activities in this category are revealing in that they are often a mix of the two categories above. Take, for example, cancer research centers. Some participants may view cancer research as assisting a discrete segment of the population that is deserving of special assistance, like AIDS treatment centers. But others may view cancer as a health condition that is so widespread as to essentially affect all, comparing it to a hospital. Low-income housing is split, perhaps because some recognize the special need of this group, but others focus on the commercial transaction of purchasing housing (even at a subsidized rate). Finally, religious activities and labor associations are relatively sensitive from a political standpoint, so those received unsurprisingly mixed reactions. Unlike in China, U.S. classification of organizations as tax-exempt is a voluntary business decision, providing a wider space for organizations to legally operate in the business sector. Furthermore, in the U.S., public reporting requirements, an independent media, and other forms of public oversight act as a counterweight to such permissive laws. In China, where civil society space is limited and the nonprofit sector is more tightly regulated, organizations may be hesitant to report, especially in a social climate where charity-related incidents are known to go viral online. Therefore, civil society may be less able to accurately monitor the charity space. In light of this relatively new law, its ambiguities, and the lack of societal consensus, the interaction between the law, society as a whole, and the organizations operating under the Charity Law is worthy of further study and consideration. China’s Charity Law has only been in effect for a short period of time. As organizations proceed to register and undergo regulation by the government, societal notions of charitable activities are likely to continue to develop—or be stalled—along with the legal framework. The role of the implementation of the Charity Law in developing these notions is yet unknown. But it is clear that the government has a large say in determining which organizations and activities are permitted to register, regardless of whether society considers them charitable or not. In addition, if the government allows organizations that fall outside of societal notions of charity to register, the public may respond negatively to the system of government oversight of charities. In the end, the attempt by the government to regulate civil society space under a “charity law” that fails to adequately define “charitable” and “public interest” raises complicated questions that confuse both legal and societal notions of these types of activities. In light of this ambiguity, a title of “NGO Law” might more accurately reflect the government’s purpose. Yet, the law is notable for its elision of certain terms commonly associated with this sector. There are only four instances of “non-profit” (feiyingli, 非营利), and the words for “NGO” and “civil society” do not appear at all. The government is so wary of civil society activities and organizations that its artificial attempt to ignore and write-out the existence of this sector is telling. Rather than merely codify or clearly delineate the contours of conventional social practices, the Charity Law is more of a top-down imposition of regulations describing the government’s idealized civil society sector, which is small and only consists of approved organizations and activities. As with many newly-enacted laws under Xi Jinping’s administration, the law seeks to exclusively define and reshape, rather than simply build upon, existing notions and structures of “charity.” At the same time, however, the government has not clearly stated how it defines its vision of “charity”; neither is there a universal understanding among civil society actors of what it encompasses. Barring further legal exposition or de facto agreement about the essential nature of charitable work, heavy Chinese government regulation in this space will likely inhibit the already narrowing civil society space, stunting the growth of the nonprofit sector and philanthropic activities in China. A portion of this project was originally prepared and presented at the Fifth Annual International Student Public Interest Law Conference in July 2017 at the China University of Politics and Law in Beijing, in collaboration with Zhicheng Public Interest Lawyers.